This is purely western culture. Villa, silent slabs, nature natural beauty, greenery fields, trees etc. Life is so beautiful in Villas. If we forget vastu for Villa then it may damage like anything. In advanced countries, they are not constructing compound walls for the villas. Likewise in India also many gated communities we may not see boundary walls. An appropriate big place will be allocated to the particular owner and builder will construct it. Just pay money and occupy it. That's it. Before buying, check vaastu for villas and the best idea is to check it with one of the best vastu consultant, he will guide one of the best vastu villa. This is a good and safe idea. 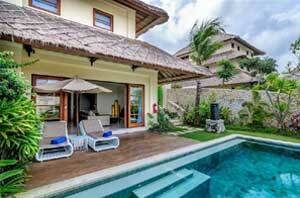 Villas are not available on cheaper prices, villas are costlier. Spending money is not bad on these properties. It' worth for someone for many reasons. Some residents may not like this culture and system. Because many villas may not construct in cities/towns. Most of the villas constructed out of city or town. Some landlords used these as their vacation homes or summer house. People lived in opaque homes, they know the value of this structure lighting and air flow. Some ladies averse to villa life, but once they experienced the life then they won't go back to cubbyhole. Follow simple techniques for villa vastu, then life will be more happier. Once residents plans to stay here, then they fell it like as village scene. They feel it is an edifice. Life will be most peaceful here, but we may not have more interaction with neighbors as we have already experience in the apartment flats etc. Again repeating here for your future safety, please show the "Villa Vastu" with one of the best Vastu Pandit and afterward only decide to buy it. Coming with vastu shastra for villas, check some of the important things. Where is the swimming pool, where is the maid room, where is the garden. Where is the car parking or garage. We seen one villa which is at Panvel there, vastu villa builders and developers arranged pools at backyard for some villas. If the pool came at East or North then no problem. If it came at West or South then it may trouble the residents, based on counting of the same structures in that community. Please note that if any resident buying this culture construction, and staying there for only 2/3 days in 6 months or in a year, then no need to be fear if this property was not shown with vastu expert. If residents bought it for their own living purpose, then getting advice from experts is advisable. We have one client in South Africa, he asked our vastu consultancy services in South Africa and we visited his bungalow and his factories in Botswana. As per his request before leaving to South Africa, we visited his Villa which is under construction almost 14 KMS from Secunderabad. There should not be Swimming pool at South direction. West direction swimming pool is not good. Southwest direction pool is not recommended. Before buying it, please observe where is the open space. If there is huge open space at East direction then this brings luck to the buyers. Huge open space towards West direction may not bring luck in the life of the residents. Some residents looking for guidance on fountain vastu. Where should be the fountain in our home. It has to be decided based on the direction of the home and sufficient space availability in the home. This is outdoor fountain, this could be placed at South, Southwest or West directions. Some experts thought that these kind of fountains can be arranged at Northeast direction. As we discussed here below, if there is huge open space at Northeast then only resident plan, otherwise, best to avoid to plan to construct this outdoor fountain at Northeast areas. 24. Gozo Sphere cast stone. Need to observe one thing. When the fountain is heavy and structured then need to alert on it. For example, if a house has Tiered Fountain, then it is better to not to plan at exact Northeast, if the house has very good open space towards Northeast then one can arrange this Tiered Fountain at Northeast too. Likewise, same principle is applicable to the Self-Contained Fountain. If a resident is planning for wall fountain, then he can arrange to any wall, no need to worry. Anyway, best to get one advice from the vastu expert then only plan for the fountain in the home. Cascading fountains are excellent at Southwest, West and South directions. 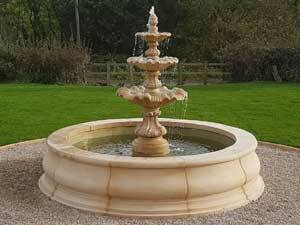 Cast stone fountains are also good to keep at South, West and Southwest directions. After finding the good site or plot as per surroundings support than first and foremost important point of house construction of Vastu Shastra is dug a well in the N-E (Northeast) corner and use this ground water for construction for quick completion of house construction and prosperity, due to this small tip the House construction may also go smoothly without hurdles. Compound wall is too necessary to get more strengthen Results. Please concentrate on the boundary wall for the entire site. In India its possible to construct the periphery wall to the entire plot, but in other countries like USA, UK, Australia etc may not have such system, partly constructed that to like fencing etc is very common in those countries. So this rule may be ruled out in some countries. Open space should be kept all around the building, that is four sides of the house., it gives us luck to the house and full of lighting, flowing of air. If you have a spacious plot, then plan for at least good setbacks to entire house to have more light and air. Flowing of air into the house is too important in terms of health and peace. Here open space means the more open place has to be kept towards East direction, Northeast (Ishan), and North Facing House Vastu. Lesser open space is planned towards South, West and Southwest corners. This is the ideal plan. Open space at Agneya (Southeast) and Vayavya (Northwest) should be equal. Some Vastu people has opinioned that trees should not be planted in house premises and shadow of the trees should not have the impression at any part of the house, this is not the right idea. In olden days our houses were built with mud etc, on those days people don't have such knowledge of cement and concrete pillar system etc. Now we are constructing homes with concrete cement supports with iron rods, so no need to worry on trees and cracks of the homes. But please note that planting trees very near to the walls are not advisable, even engineers also stated that some heavy trees should not be very near to the house walls only because of damaging the homes, its simple, their roots are very strong and they may or may not damage walls if they are very very near to walls. In our observation, we did not find such instances if the trees are kept await at least 4 feet from the House walls. No need to depend on our words on this point, you may get the suggestion from your engineer regarding standardness of the building after planting the trees etc, then only you may take the decision, greenery is most important in the house premises. It attracts positive powers, heavenly elements etc. Before planting the trees read below note. Heavy trees should be towards South, West and Southwest directions and medium heavier trees or plants towards Agneya (Southeast), Vayavya (Northwest) sides, small plants may be towards North or East based on the availability of more open space. Concentrating on landscaping is extremely favorable to the residents. Floor grass may be best suitable towards the entire area and you may go with even at Northeast also. Plenty of Air flowing should be to the house from Northeast, East and North directions to avail this facility we should provide doors or very bigger windows at these sides/directions. Based on this bigger windows are suitable towards North, East and Northeast direction walls of the house. Construction of the building at South, West, Southwest directions/sides are elevated/height (higher) than North, East, Northeast directions/sides. No peace and quarrels at the house if there is a well at Northwest or Southeast. If there is a well located towards South, West, Southwest corners then residents may face the financial crisis, heavy burdens, Health problems, sometimes it may be dangerous to life also. Regarding Vaastu Pooja at house: Vaastu is science, and it's not a deity, Vasthu pooja means you are giving respect to the area/land/plot/site/house/home etc. We should give respect to the property before starting the construction, that is called as Vastu Pooja. Still, there are some people who are going to say only the VASTU HOMA. You may do it, we never obstruct on these rituals. Giving respect to Nature is always auspicious. If new (or old) house may be purchased, clean everything, clear the dust and bad odors and secondly go with good and attractive paints to the Home. Maximum try to fill the dents or something holes in the walls with wall care. This is a good idea. Don't compromise on cleaning. This is the essential point in getting good results. If West portion is height/elevated than East portion, that plot is auspicious and construct home without disturbing this natural power i.e., height/elevation towards West direction/side. If South portion is elevated/height than the Northern portion, that plot is good and construct the house without disturbing this natural positive power i.e., elevation/height towards Southside/direction. Actually, there should not be 5 corners in a house, but it's auspicious if the 5th corner is towards Ishan (Northeast) direction. This means the Northeast was increased in this plot or site. Don't plan doors towards Southwest corner, the same may be applicable to the windows also at this direction. As per your convenience or any other reason and its compulsory for you then do one thing, make a very smaller window and most of the time close it with strong wooden plank. Planning to dig foundation then starts from Ishan (Northeast) corner, then go to East and North, thereafter go to Southeast and Northwest and later reach to South, West and last towards Southwest direction. Filling the foundation digs with concrete (pillars) then start from Southwest corner, later South, West, Southeast, Northwest and next to East, North and finally at Eshan (Northeast) corner. Plan to fix the doors to open inside only, not outside, inside an opening of the doors is luck to the inhabitants and it welcomes the natural power or energy directly enters into a house. Outside opening may not be recommended, but it may be the common thing for the mosquito mat doors, don't think more on mosquito doors, if you are serious on Vaasthu then remove this mosquito net door. Flooring heights/levels should be like this way, North to South (North should be lower and South should be elevated). Floor levels at East to West, Northeast / Ishan to Southwest/Nairuthi corners. A vastu home has to be aligned with the cardinal directions thereby reflecting the Vedic concept of the universe. Don’t place disturbing works of art such as those depicting war and misery as they may bring about negative energy. Collect more attractive collections to your house walls, particularly in living room and family rooms. As human beings, we should always try to get more auspicious powers as much as possible with our intelligence to live peacefully, in this scenario we tried our level best to get success and peace based on one ancient traditional Indian science with latest trends application amendment. If you would like to have any more points to publish here, let us know, we will be more happy to publish your thoughts or suggestions or even tips. Serve to our society. God loves people who serving human beings. What are the negative or bad Vastu effects? Wish to select a home, who is best vastu expert in Mumbai? Which part is the good area to fix the doors for West direction home? I seen plot is having Southern Southwest extension, is it good to buy? Buying a new house, who is the best vastu consultant in Kailash, Delhi? After vastu corrections, within how many days we can expect good results? What is fate, can I have any explanation for this word as per vastu shastra? A factory is for sale, it has Southern Southwest street focus, can I buy this? Uncle belongs to Royal Family, planning to build Five star hotel, is vastu help? My husband fixed mirrors opposite to bed, I am also interested to fix, is it OK? 1) Please advise the best position to place two elephants with raised trunks at home. Should it be placed a) few feet ahead of main door OR b) immediately outside the main door OR c) inside the house facing the main door. 2) While starting house construction, after digging the ground for pouring foundation concrete, can the work be stopped for about one or two months and the foundation concrete poured after that. Is there any effect due to this stopping of work. I request you to please clarify on this. is vaastu applicable to venture shapes or not? I have a well furnished house in my plot but unfartunaetly there is some sqft areas are mistakely left from South side. I AM RENOVATING MY HOUSE FROM THE NORTH SIDE BECAUCE MY NORTH PORTION IS UPER THEN THE SOUTH PORTION AND WE HAVE BORING PUMP AT WEST SIDE IN MY BUILDING WHAT TO DO WITH THAT BORING PUMP THAT WE HAVE AND IF THERE IS ANY NEGATIVE ENERGY THEN WHAT TO DO FROM THAT SO KINDLY GUIDE ME .